I deeply admire Foster’s for taking on this challenge and for responding to it without the usual tricks of late Modernism. Here, the team has really broken new ground for the practice, intelligently reinterpreting local culture, resorting to the colours of the landscape and marrying up new technologies with the very ancient wisdom of desert climate control, as practiced by the ancestors of those who will now be studying at the Institute. I feel it’s a good project in part because I’m desperate to go and look at it. You tend to know that something is worthwhile in architecture when the photos leave you dissatisfied. With Masdar, I’d like to check out the texture of those concrete and glass moulded units and to test the temperature of the courtyards compared with that of the outside in general. Some people have grumbled that this design is not quite what was proposed originally, being scaled back – but given the financial crisis, it’s astonishing that it even got this far. It also leaves open the possibility of further stages down the line. The electric cars that were intended to zoom around the campus aren’t yet in place in sufficient numbers but there is at least a promise here that a coherent environmentally sustainable vision of desert life will arise, through an unlikely marriage between a UK practice and an enlightened local patron. 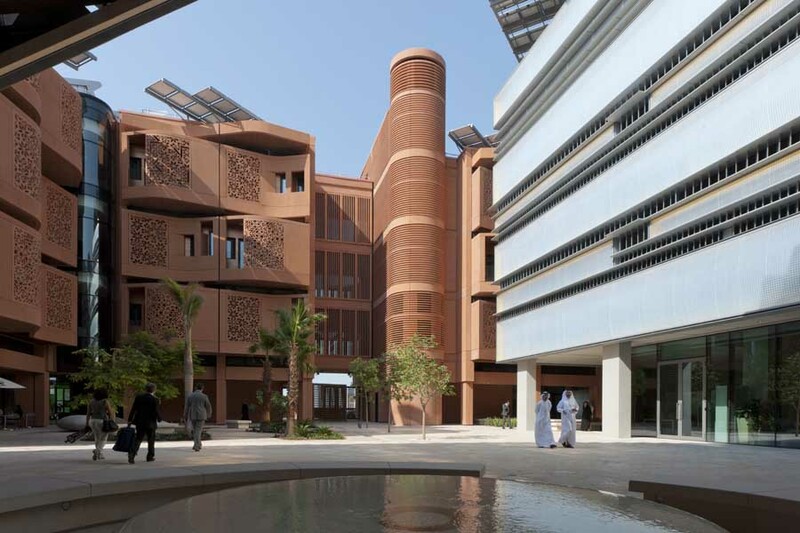 Masdar is a sign of Fosters entering a completely differently architectural domain (contextual, historical) – which it would be fascinating to see if they can hold on to even in their more traditional Western haunts. Now for something a lot less fun. It’s simply unbelievable that up and down the country, fairly responsible home-owners are told that they can’t build a garden extension because of planning regulations and then promptly, for reasons no one can quite fathom, a monstrosity like the Shard is given permission. This is a vision of the future as it looked about 50 years ago. It’s entirely environmentally unsound, it destroys the views of millions of people, it is crude, angular, vulgar and unnecessary. Future generations will look at us and wonder why we still hadn’t learnt any better. The office space being generated in the building could have happily been spread out across the surrounding area and would have renovated a part of London in need of office space and a little love. If only Piano could have had a cosy fireside chat with his old pal Richard Rogers, who could have told him why a tower like this is completely wrong for the urban context of London and that small really is both far more beautiful and far more useful. This is classic respectable American modernism, I’m sure it’s well put together and it’s inoffensive and relaxing. The interior has been really well designed, the circulation is exemplary. What it gives the city of Philadelphia is perhaps a bit more in doubt, but this is certainly a step up from Bloomingdales and other large shopping centers that habitually crowd the downtowns of major american cities. Alain de Botton is a philosopher who founded www.theschooloflife.com and www.living-architecture.co.uk. He is interested in how ideas can change the world.